Donate today and help bring affordable quality health care to uninsured and underserved patients in Central Appalachia! We are fundraising to save lives in Central Appalachia -- the Health Wagon is the only refuge for many in far Southwest Virginia! The Health Wagon's mission is to provide compassionate, quality health care to the medically underserved people in the Mountains of Appalachia. Our values are inclusiveness, community outreach, collaboration, spirituality and empowerment. Let us tell you The Health Wagon story. Our average patient is 46 years old. Eighty-six percent of our patients are uninsured. Seventy percent of them have an income of less than $20,000 annually, despite working multiple jobs. This means they make too much money to qualify for Medicaid, but not enough to afford private insurance. Our patients live in desperately poverty-stricken rural Appalachia, where they can't afford to go to the doctor but can't afford not to. The mobility of our health clinic means we are able to fill the gap, whether they are inline at the food bank or at their job, we bring healthcare to them. 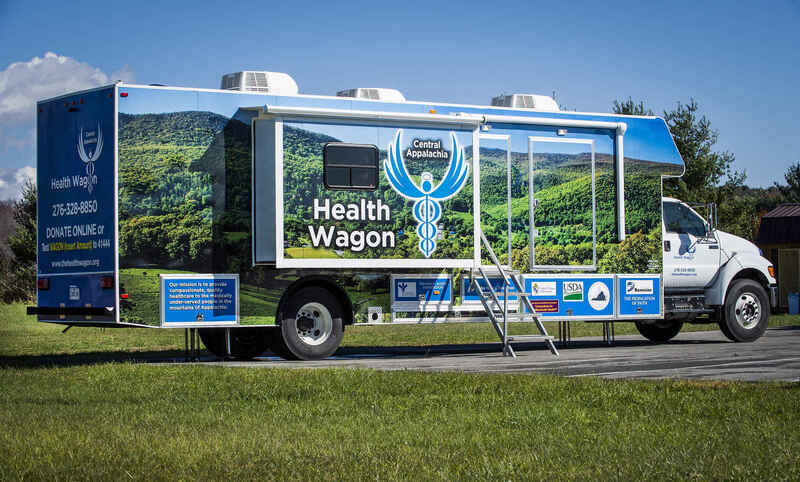 The Health Wagon with its mobile clinic and two stationary clinics has remained a pioneer in the delivery of health care in the central Appalachian region for more than four decades. The Health Wagon provides Southwest Virginia and the surrounding region with compassionate, high quality health care services. We serve the most vulnerable in our population that do not have access to health care. Our patients have no insurance or may have insurance but have high co-pays and deductibles. We create a medical home for our patients and give access to health care services that they would otherwise do without. Daily at our clinic, someone's life is forever changed or saved because of the services of that the Health Wagon offers. We create access and more importantly hope to those who come through our doors. The Health Wagon serves individuals and families with free, integrated healthcare that is culturally sensitive. We provide primary and preventive care, dental, behavioral health, telehealth, and specialty care. In addition to our routine services, we provide the region with strategically coordinated outreach efforts. We are most proud of our Remote Area Medical - Wise Health Expedition held annually which is the largest medical outreach of its kind in the nation. Individuals in desperate need of health care line up days in advance to get needed services such as free, eye, dental and medical care. We have valuable partnerships with academic institutions that allow upcoming physicians, nurse practitioners and nurses to a name a few to having valuable educational experiences along with helping individuals in dire need of health care. The breadth of our mission, accomplishments and unprecedented community collaboration attest to our commitment to the people in the Appalachian region. Caring and committed partners, including foundations, corporations, civic group, churches and businesses and individuals, support the Health Wagon and our outreaches to make delivery of health care to some of the most disadvantaged in the nation. Donate today and help bring affordable health care to those in your community that need it the most! You can also mail donations to P.O. Box 7070 Wise VA 24293. The Health Wagon is registered as a 501(c)(3) non-profit organization. Contributions to the Health Wagon are tax-deductible to the extent permitted by law. Our tax identification number is 04-3739083. The Health Wagon will not sell, trade, or share personal information about our financial donors. I am so moved by the work you do to help people truly in need. God bless you all! I have been a supporter for years because I believe this is a compassionate ministry to the underserved in our country.